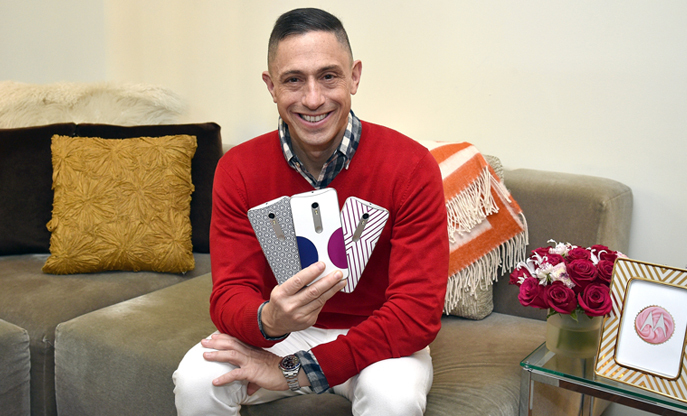 Hey Moto fans, it’s Jonathan Adler here! I’m excited to be collaborating with Motorola. Like them, when I approach design, I encourage self-expression and ignoring the “rules” - and, I’m obsessed with my phone. So, why not embrace more choice when it comes to phone design? We all deserve phones as stylish as we are. Make it Personal: Give a gift that appeals to everyone's favorite person: themselves. Even the least vain person in your orbit won't say no to a cozy baby Alpaca throw with their initials on it. Soft, squishy and luxurious -– what could be better? Think Outside the Gift Box: One of the best gifts I give myself every year is a trip to Capri each summer. If you're gifting a trip, try to find a little something for the recipient to open in advance – our Jet Set candles are available in squillions of scents and locales and provide an olfactory preview of your trip. Be Unexpected: I think good gifts are any combination of the following: super thoughtful, super premium or super unique. I love the idea of taking something utilitarian that you use every day and jazzing it up – just like I did with my new designs for Moto X Pure Edition. If it's going to be in your hand 24/7, might as well make it chic and unique. Bow & Go: I strive to make products with packaging that's as beautiful as what's inside. Just bow and go; when you're not spending an eternity wrapping it, you’ll have more time to devour the hors d'oeuvres at a holiday party. Give Good Game: I love to give games, and not just because I'm a super competitive person. If the conversation ever starts to lag at a holiday party you can just whip out a game and vanquish your boring seat mate at a round of backgammon.